With the global rise of chronic diseases and conditions, the chronically ill people have been one of the focuses of healthcare app market players. Taking up the challenge for chronic disease prevention and treatment, digital health app developers try to bring significant advances in the management of diabetes, obesity, heart disease and other chronic diseases worldwide. Although there is a huge market potential, the market penetration for all therapy fields is still less than 1%. Which are the top 3 therapy fields with the best market potential for digital health apps and are they the biggest markets in terms of global cases? According to the mHealth Economic 2017 study, 68% of mobile health app developers and publishers believe that diabetes continues to be the therapy field with the best market potential for digital health solutions within the near future, followed by obesity (35%) and depression (28%). The new Digital Diabetes Care Market 2018-2022: Ready To Take Off report also draws attention to the growing global epidemic with 642M people expected to suffer from metabolic syndrome by 2040. 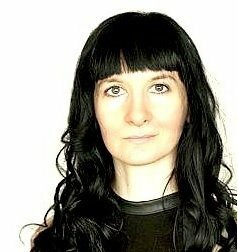 Today, mobile health apps can play an invaluable role in assisting people who suffer from chronic diseases and in most of the cases help them better and more effectively manage everyday their conditions thanks to the advances in mobile technologies, the widespread use of smartphones and wireless devices. Personalized intervention and remote monitoring allow doctors not only to gather the data and intervene when necessary, but give patients a better sense of responsibility for their own health in real time. Diabetes remains the leading therapy field for mobile health solutions and offers the best market potential as reported by 68% of mHealth apps publishers, followed by obesity with 35% market attractiveness and depressions with 28%. Depression is the therapy field that continues to gain attraction. It is estimated that this serious mental health condition will affect more than 350 million people globally (WHO, 2017) and is now ranked third as holding the highest market potential. To explore more in depth this market you can also read about the top 10 depression apps. Hypertension and chronic heart diseases follow the Top 3 therapy fields with strong future business proposition for mobile health solutions according to 24% and 11% respectively of mHealth app practitioners. The graph above illustrates the market potential for mobile applications, specifically for chronic diseases according to more than 2,400+ decision makers and experts in mobile and digital health. 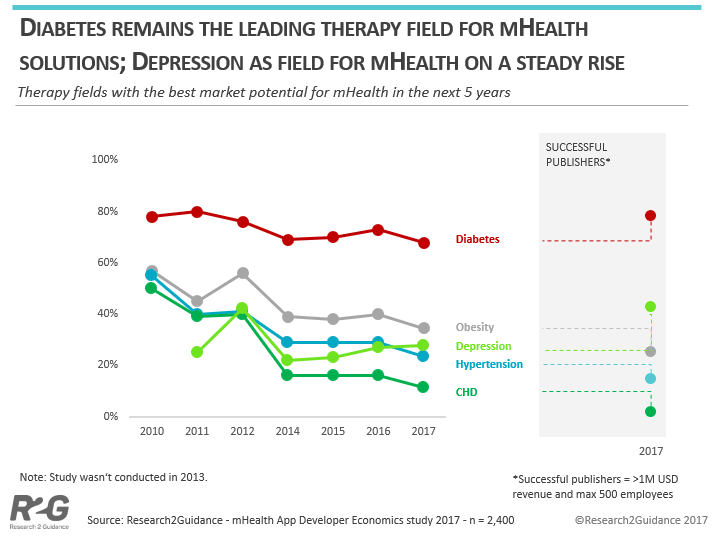 However, the successful mHealth app publishers with a revenue of 1M+ USD have a slightly different opinion about the future best therapy fields, ranking diabetes even higher than the average and choosing depression as their number 2. Apart from diabetes and depression, successful publishers are ranking all other therapy fields below the average. According to 10-12% of mHealth app developers and healthcare professionals, therapy fields such as Alzheimer’s disease, Cancer, Chronic pain, Neurological disorder and Asthma are with the least business potential and significant future growth. These conditions will remain niche markets in the next 5 years. Connected health apps and advances in mobile technologies are transforming the healthcare industry by addressing different patients’ needs/cases and encouraging more proactive patient engagement to better manage their health conditions. When it comes to therapy fields, in 2017 hypertension and cardiovascular disease are by far the biggest markets in terms of global cases with 1bn+ cases each. Diabetes, obesity and depression have respectively: 422m, 600m and 300m worldwide cases. Although the business potential for therapy fields markets is big and will continue to grow with the global rise of chronic diseases and conditions, the market penetration for all therapy fields is less than 1%. Consequently, the acceptance rate and active usage of all therapeutic solutions apps within target groups is very low. This leads to some key questions: How to increase the usage for app based support? What are the factors that will drive the penetration rate for the therapeutic apps? There are significant opportunities for app developers and a big likelihood for profitable market penetration as the prevalence of chronic diseases is increasing and so is the share of active users while current apps fall short of expectations. Your feedback and comments are highly welcomed. Tell us about your experience with therapeutic apps.